Has anybody else tried Harry's before? This was moving week for me. Lots of big changes and many trips to the store. 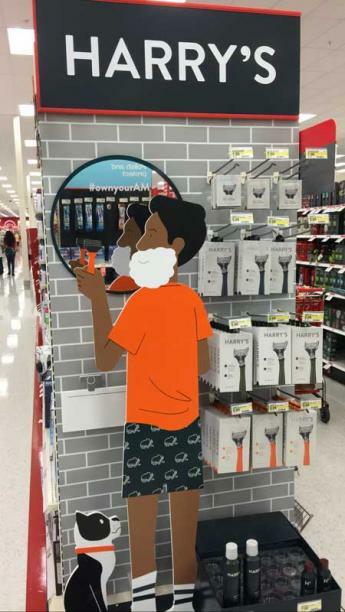 Incidentally I was out of razors and went to pick some up on my trip to Target. I saw in the razor blade aisle they had a nice Harry's end cap set up. I was a little surprised to see them in Target, I always thought of Harry's as being an online subscription thing and perceived them as being like Dollar Shave Club but maybe a little nicer. I checked out their stuff and it actually looked pretty nice. One "Truman" razor starter kit with the handle and two blades was $9.99 so I thought I'd roll the dice and give Harry's a try. I'm happy with the razors I already use and have used that brand since I started shaving. Harry's looks top shelf though, really nice and less than half the price of what I usually get. Fingers crossed they don't tear my face up. BTW - This isn't an endorsement or a partnership advertisement or anything weird. Nothing to disclose here. I'm just excited to try this new razor and curious to see if anyone here has used Harry's before. I'd love to hear if any of you have any shaving habits, use any vintage products or do anything nifty for shave time. I've always gone to The Art of Shaving for my gear but I feel like Harry's hit the nail on the head for a fraction of the price. Also, it's worth mentioning how much I've really enjoyed going to Target during this move from one home to another... and I think it's because we've been talking about discount stores in the forums. Targets in my area seem to go the extra mile with decorating the store for new video games, dressing up end caps, etc. Prices are pretty good and it's great to grab a bite to eat in one of the little "restaurants" at the front of the store. 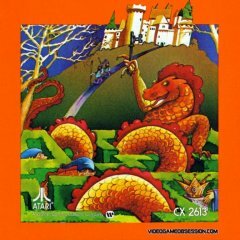 There've been more than a few times that I was in Target and thought of BTBfilms' post on K-Mart in store music, and Professor's post on Caldor's Atari & ColecoVision "Price Break" ad. I think Target is for me today what those stores were for me back then. Seems like I'm creating new memories every time I go to Target or Sam's Club. I think 30 years from now I'll look back on these times nostalgically just as we do now with K-Mart and the rest. I'd love to hear your thoughts! Now, to visit ANY type of store requires a 45 minute ferry ride (not cheap), my visits will be minimized greatly. I'll still be headed over to "town" often since there's nothing here & Target is only 10 minutes from where the ferry comes in, but most of my Target shopping will be online. Still good but nowhere near the experience of wandering the aisles looking for whatever will catch my eye. As for your original question, I picked up some Harry's at Target as well a few months ago. I was a slave to the Gillette's, which as you know cost a small fortune for a four-pack. Unfortunately, I found that I didn't get as close or comfortable a shave as I do with the Fusions. I was afraid you'd say that! You generally get what you pay for. Their presentation is really nice and I like that they're literally half the price of Gillette. It really is a small fortune for a pack of 4 Gillette Fusion blades. I'm going to give Harry's a try in the morning and see if it's passable. Great topic J! We can all learn from each others' experiences. My ethnicity and genes have given me a very hairy face. So I have to shave pretty often. I think I'm a pretty good judge of razors. Dollar Shave Club - these ones are really good. I like the 4 blade model. They last a long time and don't cause cuts. The only issue -- there's a pretty large gap between the blade and the edge of the head. That makes it hard to get some spots (like right under your nose). Price on these is excellent -- and I'll share a secret that means you don't have to subscribe....buy a gift card. You can buy on their site for any denomination. So buy the gift card, buy what you want, then don't worry about them sending anything else until you are ready to repeat the process. 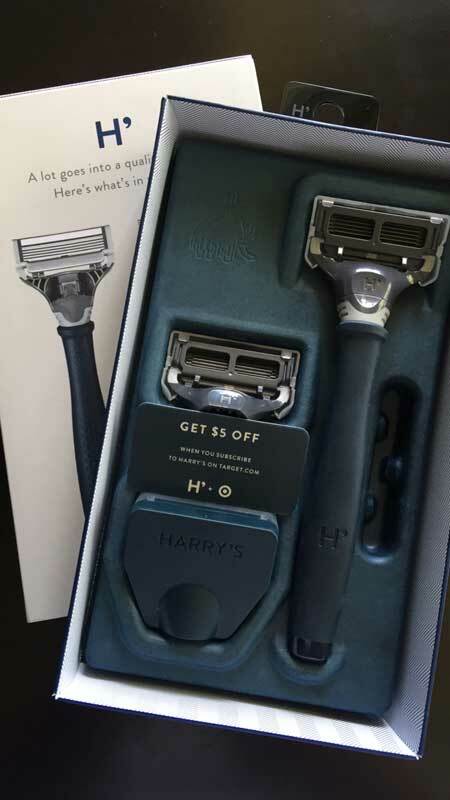 Harry's - Pretty much the same quality and pros/cons of Dollar Shave Club. A little more expensive than DSC, but it's really nice to be able to buy them at a real store. Due to the issue with getting spots under the nose -- I've gone back to a really good old favorite. Gillette Mach 3. Only 3 blades, but it's small and light and much easier to hold and use. They have these at Costco, and that seems to be the best way to get a decent deal. $27 for 17 heads is what I paid recently I think. And yet more: Make sure to really dry off your razors well after use, and they will last a lot longer. A couple of wrist snaps, then wipe them backwards on a towel a few times. I get about 3 weeks out of each razor head. I love Target too. The 5% off for the red card is really nice. Plus the stores are clean and nice. Buying games and systems there with the red card discount is really easy and a good way to save a few bucks. We don't have a Target here where I am at, and I have not yet been in one to be honest. Just a Wal-Mart here however there is a Target in a neighboring town. I found some Bic's with changeable blades. 8 heads and handle for $6. 5-blades. Does well but goes dull after about two shaves. Never heard or tried Harry's yet but will keep an eye out for them if I get to go to a Target store. I like Harry's and find them to be slightly better than Dollar Shave Club "executive" blades, especially the edging blade. I cut myself twice with the DSC edge blades right beneath my sideburns. Up until that point, I can't remember cutting myself. Harry's aren't as good as Gillette Fusion blades but at half the cost, I'll take the compromise. I really like Target but I don't think I'll ever be nostalgic for it the I was for stores like Hills, Gold Circle, or Woolworth's - which were the stores in my area growing up (Ohio). I do think that they do a great job in terms of display and stock. It's always a pretty good experience. Big Harry's fan here! I've been using their subscription service for about a year now, and I've only done three shipments of 8 blades? I agree with others that they don't give quite as good a shave as a Gillette, but for me its close enough, especially with the difference in price. I also started stropping the blades after use, something I wasn't doing before, and like Rick says, that really helps the life of the blade. I can usually get 2 weeks, maybe 2 and a half out of a Harry's blade. I'll have to check my local Costco to see if they started carrying the Mach 3 again, as I remember really liking that razor, and 27 dollars for 17 blades is pretty good; cheaper than Harry's actually which comes in at about 2 dollars a blade. I was buying Fusion blades at Costco before I switched, and they kept only carrying the Fusion Power blades, and it seemed like it was 50 dollars for 12-14 blades the last time I bought some? Pushing 3.50 or more for a blade was ridiculous to me. "Stropping" -- thank you for teaching me a new (to me) word! It's really water that dulls the blade. If you can dry it well each day, they last a lot longer. That's the other nice thing about the Mach 3 -- the back sides of the blades are almost completely open, making it easy to see that they're clean and dry. I also inherited a Panasonic/Norelco electric razor (a pretty high end model). It works pretty well, but I can't say there's much of a time savings over using a regular razor. Plus, it just doesn't produce as close a shave. Today is Day #2 shaving with Harry's. I really like the Harry's blades so far. They're not as good as Gillette Fusion, but they're close enough that at half the cost it feels worth it. Let's see where we're at after 2 weeks of use, but so far so good. I've been taking my time shaving in small repeated strokes, applying shave balm afterwards, and drying the blade well after each shave. I have sensitive skin and have to say that even after applying shave balm my face still feels more raw than with the Gillette Fusion Power blades I had been using, but it's not terrible. (It could also be that I'm over-shaving and thinking too much about it afterward. 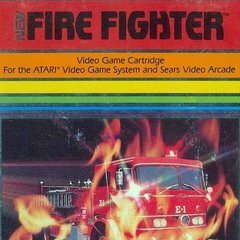 I've never turned shaving into an Atari I/O post before.) I'm happy though and really want to like these blades. I've gone back to a really good old favorite. Gillette Mach 3. Only 3 blades, but it's small and light and much easier to hold and use. They have these at Costco, and that seems to be the best way to get a decent deal. $27 for 17 heads is what I paid recently I think. Sounds like a number of people in here have tried Harry's and gone back to Gillette. I was worried that would be the case! This is true! I learned this a few years ago and was super skeptical at first. "It's water that dulls the blade, not the actual shaving?" Seemed weird. But it's true and drying the blade first really does make a difference. I was changing blades on the 1st and 15th of the month and the blades would that long without a problem. I can usually get 2 weeks, maybe 2 and a half out of a Harry's blade. I'm hoping I can too. My Gillette blades could do that, I'd like my Harry's blades to go that long too, to make the price difference worth it. Not gonna cut my face up though. I was buying Fusion blades at Costco before I switched, and they kept only carrying the Fusion Power blades, and it seemed like it was 50 dollars for 12-14 blades the last time I bought some? Pushing 3.50 or more for a blade was ridiculous to me. I agree! I was buying Fusion Power blades at The Art of Shaving a number of years back when Fusion was new. Then Sam's Club and Costco started carrying them in bulk packs, so I started getting them there. 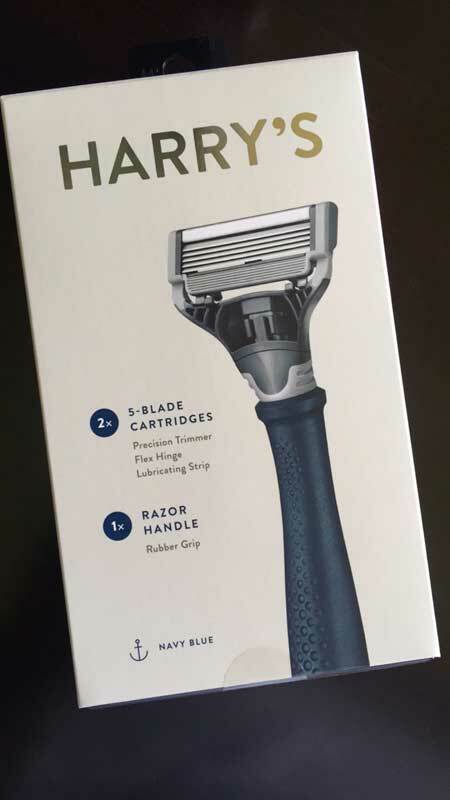 But running out of razor blades and randomly having to drop $50+ one weekend on new razor blades felt like a bigger commitment than it needed to be. $7 every now and then for a pack of 4 Harry's blades is a lot easier of a bite to chew. Harry's aren't as good as Gillette Fusion blades but at half the cost, I'll take the compromise. Me too! I'm finding that to be the case. Today is my second day shaving with Harry's. So far it's not as good as Gillette Fusion but it's close enough and half the cost. Seems worth it so far. I like Target too! I've found the Wal-Marts in our area usually have the best prices, but they're also pretty sketchy. Dirty floors, dirty shelves, rowdy people. I've been to Wal-Marts in other states that are nice. I really like our Sam's Club, which is a subsidiary of Wal-Mart. It just won "Club of the Year" from Sam's. It's clean, well-stocked, great prices usually, and even the food in the "food court" area is pretty good. I'll usually grab a hot dog, slice of pizza, or salad from there about once a week. Rarely do I pay over $3 for my meal! I really like going to Target. Their prices are usually pretty decent (though sometimes not as low as other places) but our Target stores are always clean, well-stocked, brightly lit, and the people there are pretty nice. I also like that Target seems to carry a lot of nice stuff and a lot of it is their own. They'll have some decent clothes, some nice stuff for the home, even special edition board games etc. that you can't find anywhere else. I like the vibe there, and it's not a place that I dread going like I do Wal-mart at 2am. We don't have a Target here where I am at, and I have not yet been in one to be honest. I'm surprised to hear that! I thought Target was almost everywhere Wal-mart is by now. Meanwhile poor K-Mart is disappearing from towns all across the country. So true! I'd like to think I'd be nostalgic for these times at Target -- but it's hard to beat the nostalgia of places like Woolworths, Hills, and for me K-Mart where I was growing up. So many good memories of eating in the little restaurants there, or at the mini Little Caesar's Pizza Place inside of K-Mart. I read some reviews though, and using a dry towel is almost just as good. You could probably take a piece of old jeans and do the same thing as well. I used to use the Braun electric with the cleaning station and everything, and it wasn't bad, but again its that pain point of when you need new blades, you're shelling out a large chunk of dough. I also had trouble finding the cleaning solution cartridges sometimes, and those were also fairly expensive. It seemed like the blades just weren't holding up as well as a straight razor, and I also didn't get as good of a shave as I would with a manual razor. I used to buy from dorcousa.com. supposedly, dollar shave club gets their razors from these guys, repackages them and then resells them. Dorco is a bit more up front being you buy in bulk but it's much cheaper in the long run. I use a safety razor now. I love using a safety razor, I recently picked up the offerings from Bevel, which are also available at Target. Astra is a decent brand of blades but if you want something thats sharp enough to cut through stone, try Feather brand blades. Gillette is out here misleading people and effectively encouraging people to wear their blades out early. This video, which Gillette put out to instruct people on “how to clean and maintain your razor”, contradicts almost every point we discussed above. It’s as if this video was made for the sole purpose of addressing these points and knock them down one by one, under the guise of an instructional “how to” video about razor maintenance. This is the opposite of what we discussed above. I wanted to clean the soap scum off of my razor handle and went on YouTube to search for a video. It’s not the blade itself I want to clean mind you, it’s the little bits of soap and dry shaving cream that gets into every crevice of the razor handle. I thought I might need to soak it in CLR or something. Then I came across this video. To clean the handle, I just run it under the tap and scrub with an old toothbrush. No blade on, of course. Our local food pantry gave out a Fusion with two blades plus a package of twelve cartridges. We get to visit once a month and the November and December visits I got those. I love those Fusions. They're nice. I noticed the other night that our local Wal-Mart got Harry razors. For the price I may give them a try. Much cheaper than the Fusions. Those things are expensive. I guess I got lucky with the handout I received. And I had misunderstood what Justin was saying about Gillette. I wash them off and then dip them in rubbing alcohol to help clean them. I ignore what Gillette says but I have noticed it doesn't matter what you do...Gillette blades just don't last long. I just finished off a pack of "Bic Hybrid 4 Flex" razors, which I got at our grocery store for about $5 (4-pack). RickR says: Not bad at all! They last about 3 weeks each for me, and do a really nice job. I was surprised. Next up for me is a giant 36 pack of Gillette Custom Plus 3 razors I got from Costco for super cheap. I think they were $24. These should last a LONG time. So far so good, I've been using one for 3 days with good results. I like how small the head is. Easy to maneuver. I normally don't buy full disposable, but the price was too good to pass up. I'm hoping to get 2 weeks out of each one...possibly 3. We shall see. My problem with Harry's: It's not the blades. They are great. It's the handle. I got mine as a gift, and they got me the gold "monogrammed" handle, which looks great. The problem is that it has no ridges. Smooth metal. Once it gets wet. it's hard to grip. If I go back to Harry's, I need to invest in a new handle with ridges. So let this be a lesson -- stick with the low-end handle and skip the fancy monogrammed one.